The Kid is in. The Great Decider is out–and so are slimy campaign innuendos. I’ll not be sorry to hear the last of the slander of the good Maverick family name. 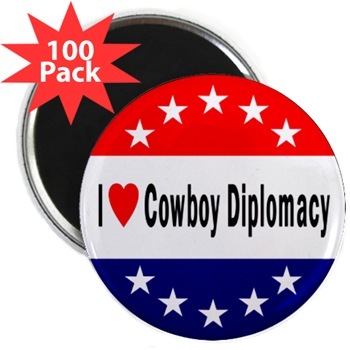 I’ll not be sorry to have less of cowboy-diplomacy-this* and cowboy-foreign-policy-that drop into my inbox with such alarming regularity. And I won’t be surprised if this James Stewart-esque president-elect (see Wanted: Cowboy Presidents) learns to appropriate a little more of the cowboy attitude to lead this nation. So I have a few cowboy wishes for him. May his hat always be wide enough. May he never step in horseshit. May his belt buckle never get bigger than his head. May his boots never pinch. 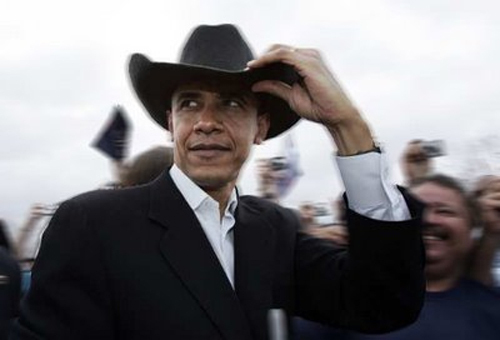 May he never have to pull the six-gun from the holster. May the horse he rode in on be a sturdy mount for the next four years. * Darn, what the heck is everyone going to do with 100 of these? Life must have been easier in the 1950s. Within half an hour, it was possible for a good guy to vanquish a bad guy, be a role model for youngsters, and look good in a holster. Between 1957 and 1963, TV viewers (many of them women) turned on their TVs with gusto, anticipating the next installment of courtly gunslinger Paladin’s next deed of derring-do. 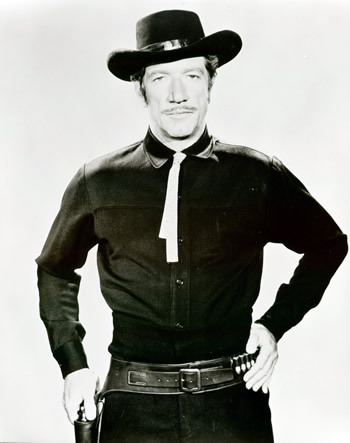 Played by craggy-faced Richard Boone, a popular method actor and descendent of Daniel Boone (neat-o! ), this character is first seen in a ritzy 1870s-era hotel in San Francisco, dressed to the nines, cigar in hand, and newspapers open on his knee. After scanning the headlines for evidence of venality, brutality, and greed (and the lobby for an attractive female**), Paladin invariably slips his calling card into an envelope for the trusty hotel’s servant, “Hey Boy,” (ick) to mail. “Have Gun Will Travel” was Paladin’s motto (and the title of the TV show). He wore black blacker than Johnny Cash’s suits. Trim slacks and shirt, aced with a tight concho belt around his hips and the low silhouette of a back hat. His gun–prominently and über-phallically displayed in the series’ opening shots–is a lean, mean machine with a silver image of a paladin chess piece on the grip. The whole set-up is well worth fawning over (as I’ve been doing, breathlessly) for a host of reasons, from technical virtuosity to sublime subliminal messages. 1. Top-notch production values. No fiberglass rocks here: Bend, Oregon, and Lone Pine, California, are the locations. Music by a famed composer who wrote music for Hitchcock, a popular theme song, and scriptwriters like Gene Roddenberry elevate this above the average oater; actors like Angie Dickenson, Jack Lord, and Charles Bronson join Boone’s gruff sharpshooter in intoning lines that are as eminently quotable as they are melodramatic. 2. Style. 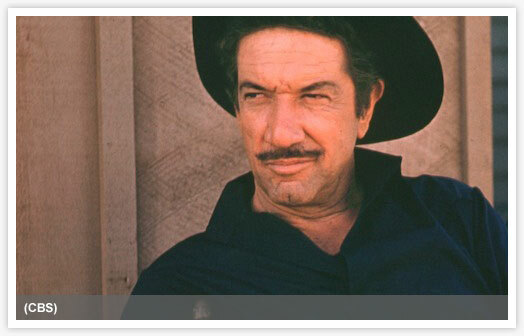 While John Ford originated the classic western look, TV shows bring it to a more stylized, almost modernist level. Think John Ford for a moment: Monument Valley. The claustrophobic interior of a bar. The swing of a gun and the piston-like legs of a horse. Ford created the symphony; leave it to TV producers to create a visual jingle that you can’t get out of your head. The directors of this series hone the stylistic glory of Ford to a few simple signature shots that look as if they’ve tracked the eye movements of people watching westerns and discovered the essentials that people look at: crotch, lips, eyes, gun, crotch, breasts, horse, gun. The opening shots themselves: The viewer is greeted by a close-up of Paladin’s hip, the camera centered on the silver chess knight on the gun’s grip. 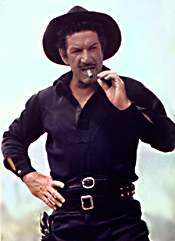 Accompanied by clipped voice-over by Boone, the gun is pulled from the holster, held for a moment in half-erect state, then aimed straight at the viewer (the barrel shakes a bit but is still effective), then roughly jammed back into the holster. What more do you need? Oh, right. Throw in a couple of women (there are some good girl parts, but not many) and a horse (Boone doesn’t deign to have a favorite mount–it’s a very unsentimental show). Imagine! There was a time when both having an accurate shoot-from-the-hip response and being educated were deemed heroic. The Cold War hero Paladin was a global adventurer (knowledgeable about foreign policy) and he believed in fundamental individual, family, and community values. He was definitely an Other, above the common reach of mortals (and with seemingly godlike wealth), but all of him–talent, education, core values, devil-handsome grin, weapon, thirst for doing good–were at the service of all. Who are the TV heroes now? I’ll get back to you on that one…. * Sounds great but meaning? ** They had to ensure that the viewer would see him as heterosexual, at all costs. Too bad. ***The real reason he doesn’t have a wife or girlfriend. A governor is the one to advocate for the economic well-being of his or her state, but environmental concerns also need a fiery protector, especially now that history, science, and common sense are showing the close interdependence of flora and fauna, up to and including humankind and sea mammals. At at time when “independence” and “maverick” are thrown around like lariats in tries to hook the horns of voters, the idea that human beings are stewards of the Earth is still viewed as hippie-gibberish, better suited for bong hits in basements than government policy and individual responsibility. O that Palin’s words were purely a desire for succor for the human population of Cook Inlet! (Much of which is predicated on jobs and services in the area) That kind of request must be heeded and play a part in negotiating the tricky terrain of living and working with endangered species (kind of like a “leave no trace” ethos for businesses and homes–hard enough to do when one is backpacking alone, and so imagine striving for that with asphalt roads and piers and trash pick-up and sidewalks). But alas, there are echoes of the sweeping late-nineteenth-century pronouncement made by Sheridan before the buffalo were nearly decimated by big guns and bigger egos. The original buffalo hunters didn’t follow good herd conservation. Plains tribes, before the horse arrived on the continent, relied on cunning and steep cliffs, duping vast swaths of buffalo to bolt toward a precipice and fall to their deaths. Note that the fabled buffalo herds of the past, which covered the grasses from horizon to horizon, were an anomaly–a brief swell in population between hunting and blizzards. But while cliff-hunts left their mark on local herds, they allowed the migrations to continue, permitting the Plains ecosystem to sustain itself under the hooves of the buffalo. The near-extinction of the beasts came not from hunting–even with the heavy Sharps rifles of buffalo hunters–but from policy based on nineteenth-century belief in the superiority of human beings over other races and species and in an unshakable perception of the availability of the limitless world of resources. The next buffalo hunters were a scrappy lot who started their businesses when the market for buffalo robes and fertilizer were high. They were the entrepreneurs who ventured forth with rifles over their shoulders to kill the beasts and harvest what they needed, leaving the bodies to rot by the hundreds and thousands. 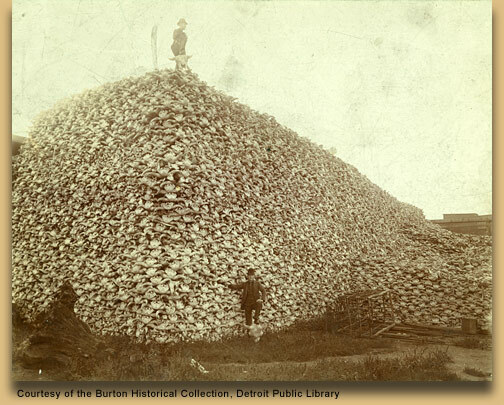 When the buffalo bubble burst, they were the ones stuck with mountains of bones and stiff hides on their wagons. Enter people like Sheridan and the reckless sportsman types, who got a thrill out of sending these lumbering animals crashing to the ground with a well-placed bullet. Enter the thin rails of train tracks arcing their way across the land, allowing egress into the herds that had not been possible before. Enter the idea that the land is a ripe plum for the taking, if only those pesky natives were out of the way. Enter the possibility that policy and law will tout an extermination of a species and a people, all for the greater glory of civilization. But we need to let off the hook the earlier buffalo hunters, those small-business owners who, yes, wasted mountains of carcasses in the hopes of gaining some ground fertilizer and warm hides. I would instead skewer the policy-makers who condoned extermination, those in government who put to paper words that permitted summer sportsmen from the big cities to hang from trains and blast away, all for the sole purpose of permitting white men to walk from sea to sea without impediment. 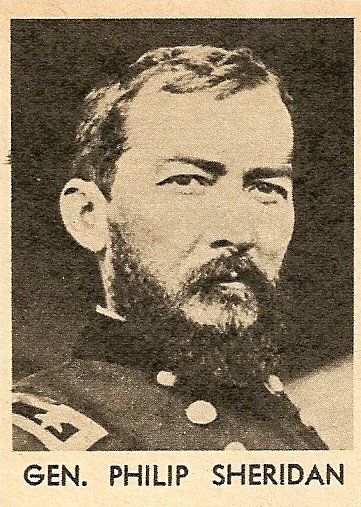 Sheridan (short and seriously suffering from a Napoleon complex) purportedly said, “The only good Indian is a dead Indian.” He was also the Union general who pioneered “scorched earth” tactics in the Civil War (condoned by President Lincoln). For all his leadership ability and battlefield heroics, he was a product of a racist and close-minded time. For all of progress made since that time, we still allow a century-old perspective to dictate how we tread in the world (heavily)–or we embrace its ethereal and unrealistic nature-is-untouchable reaction (I guess we’re supposed to float above the Earth?). Whether one fights for a mild-mannered owl or fishermen’s rights, the best policy is one that has come to being through argument and dialogue. Yes, laws from policies are always flawed, always compromising one side for the other, but they ever inch closer to a goal of wise stewardship. Arguments based on the bald assertion that where corporations roost, all beings will benefit are old-school nineteenth-century, are End-of-Days kind of thinking. They show a lack of foresight and because of the us vs. them stance, they donot permit the kind of dialogue and future-oriented problem-solving that is needed in order to ensure that the human population can sustain itself much beyond 2075. Many thanks to Batboy42 for the canny and hilarious channeling of the Hero’s path in not one but three parts. 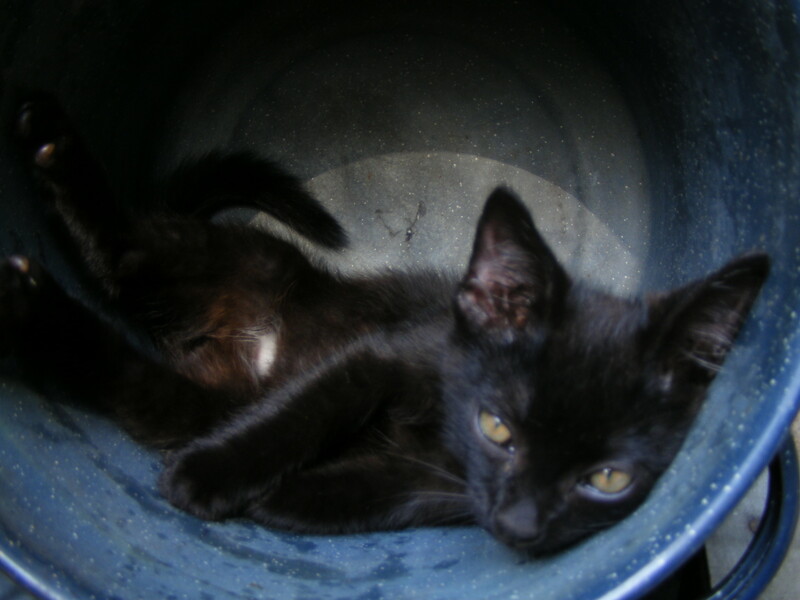 I also have to give a fond good-bye to Batboy42’s namesake, who joins the cat herds in the sky. Eaten by coyotes–not some weird things-are-getting-west fable, but a real and sad possibility when you live in the rural world. Happy heavenly trails, Batboy.